PARADISE BLUE BY THE SEA VILLA – Wake up and walk out of the villa directly on to the white powder sand beach just a few steps away from the tranquil clear Bahamian turquoise sea. Paradise Blue is located in the Palm Cay Resort a new gated luxury resort community located in Palm Cay, New Providence, in the Bahamas. Only 15 minutes from the capital of the Bahamas, Nassau, 30-minute drive from Nassau's international airport and 28 miles from the out-islands, Palm Cay is a new private oceanfront resort and full-service marina community encompassing over 69 acres of prime Bahamas luxury real estate. With 1500 feet of white-powder sand oceanfront, and over 1200 feet of powder-soft, tranquil beaches safe for swimmers, it also offers some of the finest fishing on Earth. The resort community also offers tennis courts, children's playground, freshwater pools, Beach Club with restaurant, Beach Grill and full-service Marina. Paradise Blue is a 2,400 square foot luxury villa on 3 floors with 4 beautiful bedrooms 2 with en-suite bathrooms and 2 with a shared separated bathroom plus a ground floor queen sleeper sofa with a dedicated shower room catering for up to 10 guests (not including infants under 3 years old). The ground floor walk in shower facility is exclusive to Paradise Blue and the only one of the beach front villas that offer this and is very useful for guest that may have difficulty walking up stairs. The villa offers amenities that will make your stay more comfortable and pleasurable, including complimentary high-speed internet and cable TV to all bedrooms. The villa is air conditioned throughout with separate central air conditioning units for each floor to suite guest with different temperature comfort levels. The master bedroom features a queen bed, lovely décor and an en-suite bathroom. Step out to the balcony that looks over a beautiful pristine white sand beach and the famous crystal clear and calm Bahamian waters. There is a second bedroom on the same level and is furnished with 2 single beds (can be joined to make a single king if requested). It has its own en-suite walk in shower. The third and fourth bedroom on the top floor are both furnished with queen-sized beds and have a shared large bathroom with a shower. The living room at Paradise Blue is spacious and has been custom designed and decorated differentiating it from the standard Palm Cay layout and features very comfortable sofas, lovely art work, beautiful fabrics and tiled flooring. The entertainment system includes a large flat screen offering a wide range of cable tv channels, as well as high speed internet and Bluetooth music soundbar. The kitchen at Paradise Blue is fully-equipped with a stainless-steel freezer-refrigerator with automatic ice dispenser and all essential appliances and kitchen ware you may need to cook and serve your own creations in an open layout so that you can interact with everyone while having a straight view of the beach and sea. All water to the unit is filtered with additional micro filters and carbon filters for the serving island's drinking water faucet and the freezers ice maker. There is also a laundry closet on the second floor with a large washer and dryer. Outside the villa, by the back patio, there is an outdoor shower, table and chairs along with large padded beach lounges and a day bed for two to relax and sun on with an unobstructed view and access to the beach and sea. There is also a Webber gas BBQ for your use during your stay. The villa also caters for your safety with smoke detectors and carbon dioxide monitors on all three floors. There is a fire extinguisher and a secured person combination safe available as well as a first aid kit. The villa is equipped with emergency lights should the power be temporarily interrupted. Guests of Paradise Blue Villa can simply take a short stroll to the Clubhouse Restaurant and enjoy meals or a drink during the day or at night. The Clubhouse offers jazz night of Fridays and barbecue day on Sunday, be sure to check with at the Welcome Centre for further details or any additional activities. The Marina in the complex offers several water-based activities, such as charter tours, boat rentals, snorkelling and much more. A selection of non-motorised water sports are also available for hire and are yours for the partaking, when clear turquoise waters serve as your backyard. With your stay you also have access to the tennis courts, children's playground, Residents pool, located 30 meters away from Paradise Blue by the Sea Villa between Block 2 and 3 and is quite spacious, surrounded by an expansive deck looking out to the sea , Dockside Café, Provision Store and the full-service Marina. 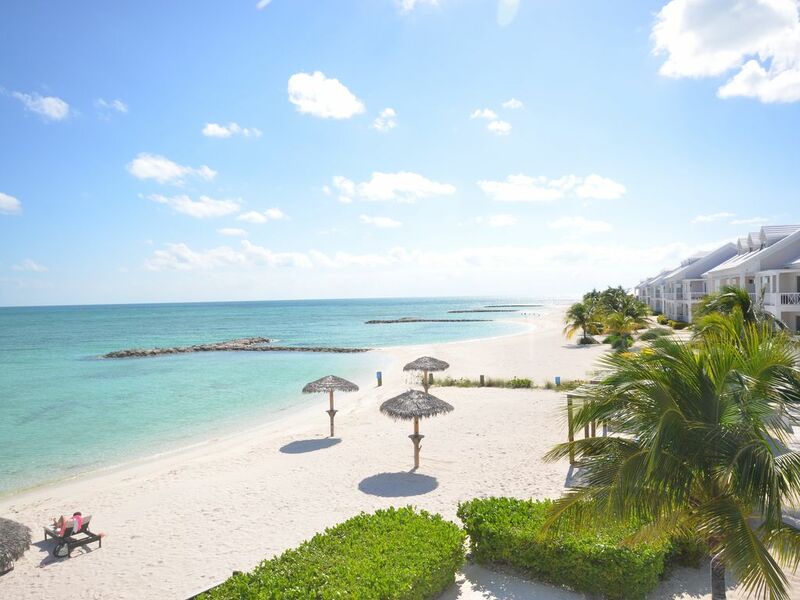 The Palm Cay Beach Club also has rental guest upgrade membership facilities available which include the Beach Club Members beach area facilities, this includes use of the new large Adult pool and a smaller children pool, it also provides access to the member beach area and day beds. You can pay an additional fee to access these facilities during your stay should you wish to. Please check out their website at www.palmcay.com; https://www.palmcay.com/palm-cay-club/ or visit the Welcome Centre while you are there, as their polices and rates vary frequently, to get more details to assist you to decide if these packages are suitable for your vacation experience. Please note that these facilities are operated by Palm Cay Resort Management and not the individual villa owners. This is an optional upgrade. Without the upgrade as a rental guest of Paradise Blue you will have access to: Tennis Courts and Children’s Playground, Dockside Café & Boutique and Provisions Store, Club House Restaurant, Palm Cay Resident’s Beach Area, , Rental of Sports Equipment (Kayaks, Paddle Boards, Bicycles), Rental – Boat Tours. Arrangements for airport pick up to and from the airport can also be made for guests at the time of the booking. We work with licensed and qualified tour operators to ensure you receive a trusted safe and cautious service at competitive rates. This home is a treasured family home not part of the Palm Cay resort rental pool. We take pleasure in being able to share our holiday home with you and have tried to provide everything we feel you will need to enjoy your stay in our little piece of paradise. We offer the unit as a self-catered unit, you are required to provide your own food, drink and personal items needed for the duration of your stay. Inquire now and let me know how I can assist you to have the beach holiday experience you are looking for and will always dream of, until you can return again. If you have any questions or if there is anything I can do to assist you with staying at Paradise Blue at Palm Cay, please let me know. I look forward to you staying at Paradise Blue at Palm Cay in the Bahamas. Born in Jamaica, I am no stranger to beautiful tropical islands, however, having visited Palm Cay in the Bahamas fell in love with the location and way of life and the friendly residents. I now consider this my home away from home. You can contact me or my sister Lisa Clarke for any questions or assistance you may need in booking our property. This property is truly a rear gem that possesses all the hallmarks of what makes a beachfront holiday home an enjoyable experience. From the casual yet luxurious amenities of the house to the facilities available in this spacious and quiet gated community while just minutes drive away from the busy attractions of the town of Nassau and Paradise Island. You will be spoilt for choice between things to do and not wanting to do anything but relaxing on the beach. The choice is yours. Both bedrooms on the second floor have their own en-suite bathrooms with large walk in showers and sitting bench. The two bedrooms on the third floor share a large bathroom with walk in shower and sitting bench. There is also a walk in shower on the ground floor which is unique to the beach front units and specially built for members of the family that have difficulty negotiating the stairs to the upper floor bedrooms and bathrooms. Located in the Royal Palm Cay Condominium complex with Marina, club house - bar and restaurant, tennis courts, children play area, water sports and walking & cycling tracks. This brand new 4 bedroom condominium is located on an pure white sand beachfront location with with unobstructed sea views from all three floors. Walk from the living room directly on to the beach. The kitchen is a newly built fully equipped kitchen with electric 4 burner stove and over, dishwasher, microwave oven, toaster, filter coffee maker, blender, tea kettle, food processor and utensils. The front door entrance and to the beach are not wheelchair accessible, however, we have specially built the ground floor to have a walk in shower for those that are self mobile but have difficulty negotiating staircases to upper floor bedrooms and bathrooms. There is a beach side pool for your use included in the rental, it is located between block 2 and 3 of the Star fish Isle beach side blocks. The Members Club pool available for use with optional fee. This is our treasured family holiday home, we are delighted to be able to share our home with you and have provided everything we feel you will need to enjoy your stay at Paradise Blue. We do appreciate if you abide by the house rules and the rules of the resort complex. The home is not a serviced resort unit nor part of a rental pool that we can relocate with other units in the resort. Cleaning services are available if required during your stay at additional cost, please advise if required. We provide paper toilet and hand towels for normal use. Due to spoilage and risk of food contamination of perishable goods and cooking items unused by guest, the cleaner may remove these items and try not to leave any opened food items for your arrival. If you do find any food items that are perishable or short expiry dates we ask you to use with caution or discard. This is a self catered unit, your will be responsible for purchasing your own food, drink and personal items required for your stay. We just got back from a week’s stay at this beautiful condo. It doesn’t get any better than this. The condo and the location were amazing. There was plenty of room for eight adults and the condo had everything you could possibly need. John was very helpful both before and during our stay. We had a couple of very minor issues at the condo while there and they were taken care of immediately. We were also more than pleased with John’s recommendations.....boat trip with Island Time Charters, Cheryl’s Taxi Service which we used all week-they were very prompt and reliable, and the best night was when we hired Chef Everton to cook us a meal. The best vacation spot....just walk out your back door and you’re on a beautiful sandy beach, can’t beat it. Definitely plan on going back again next year!! The absolute best vacation we’ve ever had! The place is exactly as described and John is wonderfully accommodating. Can’t wait to plan our next visit. Very nice unit, right off the beach. The place was clean and well decorated. We spent 5 nights at Paradise Blue--4 adults and 5 children (ages 2-11). The place was spacious with three floors of living space and 4 bedrooms/4 bathrooms. The photos do not do justice to the place-spectacular! The beach and ocean are right outside the back door and patio. The kids loved playing in the sand and the ocean which was calm and safe for the little kids. The adjacent marina club had everything you could ask for, bar, pools, restaurant, and water sports. The kids rented paddle boards and spent all day in the ocean. There is a grocery store close by but requires a taxi. We hired Chef Everton as he was recommended by the owner. He was phenomenal--highly recommend him and so worth the money. He is easy to get in touch with and will work with you on creating menus that fit your needs. Can't say enough good things about Chef Everton. We used Cheryl's Taxi Service to/from the airport which is roughly 30-40 minutes each way. We definitely plan on coming back. We travelled to Bahamas with 5 children and 4 adults. We never felt crammed with the 9 of us in the condo. Each level had 2 bedrooms, so our families had our own floors. There are a lot of stairs to get to the top floor but we didn’t mind, good exercise. The kitchen had everything you’d need. There were some leftover spices people had left behind which were useful. There were lots of extra blankets and sheets etc. The owner John was extremely helpful during the whole renting process and quick to respond to questions. Thanks John! We had the recommend chef Everton come in for dinner one night. Great and so much fun. Worth the money. The views of the place are exactly as seen in photos. Unbelievable. Felt like a magazine. The beach was perfectly sandy for the kids. They didn’t even need water shoes. There were lots of left over sand toys at the condo as well. The palm cay marina club itself is very expensive. We found the service about a 6 out of 10. Your paying 17$ US for one cocktail. Just a heads up if your not planning on making your own drinks. The pizza was good at the marina. But I wouldn’t recommend really anything else. The pools at the complex were great. The grocery store is walking distance. The park at the resort is really nice but there is no shade over the playground equipment. There is a gazebo off to the side with shade if you need a break. So it’s hot If your considering taking really little children. We didn’t stay long. We went to paradise island for a day. It was fun but feel like it is overrated a little. If your thinking of going, look into renting a room at one of the partner hotels. Sometimes it’s cheaper to do that and get free passes to the park instead of just buying day passes for everyone. I would return to paradise blue with my family for sure. It was a vacation to remember ! Paradise Blue really lived up to its name. The house was even better than described -- well-appointed, up-to-date, and phenomenally clean with a great layout. It truly surpassed our expectations. From the minute we walked in the door and saw that beautiful view of the white sand and sparkling Bahamian Sea, we were hooked. John's recommendations -- from Cheryl's Taxi Service to the culinary expertise of Chef Everton (we had him cook for us twice -- delicious!) -- were fantastic. He was incredibly responsive and thoughtful throughout all of our interactions, both before and during our stay. We couldn't have asked for a better, more relaxing week! Hope to be back next year! CONFIRMING YOUR RESERVATION By submitting the rental deposit, the Party Leader is stating that all persons occupying the accommodation have accepted these Terms and Conditions of this Rental Agreement. The Party Leader will be responsible for the full cost of the accommodation and other services contracted. DEPOSIT All dollar amounts are US dollars and should be paid in US dollars. A deposit of 25% of the total rental fee is payable to confirm the reservation. The deposit is due to confirm and guarantee your reservation. Failure to make this payment subjects your reservation to cancellation. FINAL PAYMENT Final and total payment on this invoice must be received not later than 60 days prior to commencement of the rental period. For holiday periods (Thanksgiving, Christmas, New Year and Easter) we may require final payment 90 days prior to commencement of the rental period. CREDIT CARD AUTHORISATION Where a credit card is being used for payment, the Credit Card must be in the name of the Booking leader’s name. A copy of a photo ID (Drivers licence or Passport) must also be provided of Credit Card holder. If the credit card is not in the Booking leader’s name a Direct Debit Authorisation form needs to be provided by credit card holder along with a copy of their photo ID. Failure to provide this can result in the cancellation of your booking without compensation. CANCELLATION POLICY The Owner must receive notice of any villa cancellation in writing by email for consideration. Cancellation of reservations falling less than 90 days prior to scheduled arrival date but more than 60days may result in forfeiture of all funds paid. For reservations cancellations notified less than 60 days prior to scheduled arrival date will result in forfeiture of all funds paid. There are no refunds granted for no shows, late arrivals or premature departures, reduction in number of persons in your group. Subletting to another party is not permitted. Please see full Terms and Conditions.